Cato Institute is a ‘public policy research organization - think tank’ which was founded 1977 by Edward H. Crane and Charles H. Koch, the billionaire co-owner of Koch Industries which is the US’ second-largest privately owned company and the largest privately owned oil company, with annual revenues of more than $30 billion. Although it has a smaller budget than some of the large think-tanks it was seen, in the late 1990s at least, as the fourth most influential think tank in Washington. 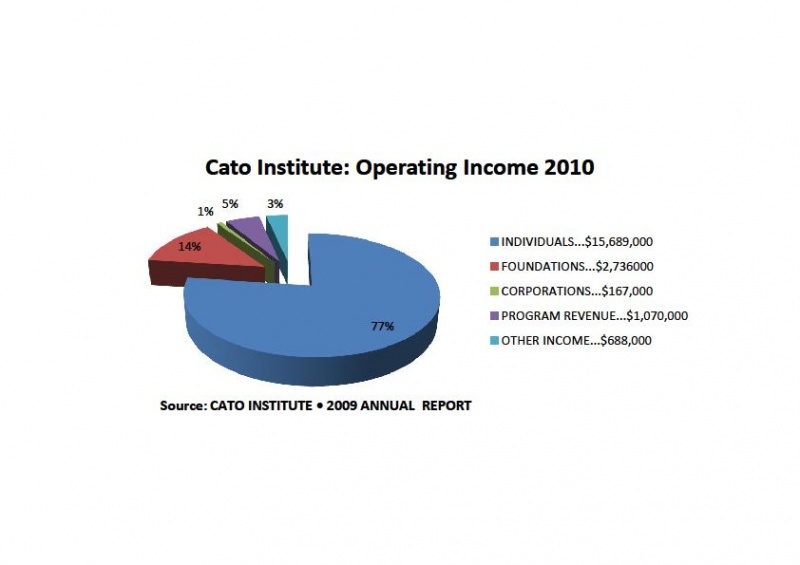 Cato maintains that “In order to maintain an independent posture, the Cato Institute accepts no government funding or endowments. Contributions are received from foundations, corporations, and individuals”. Chevron Companies | Exxon Company | Shell Oil Company | Tenneco Gas | American Petroleum Institute | Amoco Foundation | Atlantic Richfield Foundation Since 1998, it has received some $50,000 from Exxon Mobil. To put their financial commitment into context, from 2005-2008 the Koch brothers pumped in double the amount that even Exxon Mobil spent on undermining climate action over the same period. 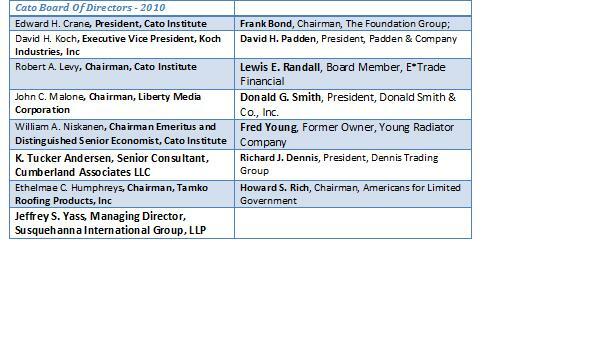 Greenpeace argue that the Cato Institute has received $1,028,400 from Koch foundations between 2005-2008, the total amount of Koch foundation grants to the Cato Institute between 1997-2008 is $5,278,400. According to a research program by the Political Economy Research Institute, Koch Industries came 10th in a list of the 100 worst toxic air polluters. Koch Industries was sued by the government in 1995 and 1997 over a reported 300 oil spills at pipelines which were owned and operated by the company. The lawsuits included stringent penalties - from $71 million to $214 million- placed on the company for dumping an estimated three million gallons of oil into lakes and streams in six states . Rupert Murdoch, President and CEO of News Corporation joined the Cato Institute board of directors in 1997, he was welcomed as ‘one of the most successful entrepreneurs in the world, a strong advocate of the free market and a committed civil libertarian’. Rupert Murdoch worked closely with fellow board member John C Malone (then president and CEO of Tele-Communications Inc, the largest U.S. Cable operator) to ‘actively promote the deregulation of the television and telephone industries’. The Cato institute advocates the privatization of the Internet and communications systems. Despite Murdoch and Malone’s place on the board of a libertarian think tank both profit from government subsidies. Murdoch’s News Corporation profits from licences issued by the state which are worth millions of dollars. Similarly, cable TV corporations such as TCI (Fronted by Malone) are able to expand their services, and in turn their profits, under the protection of federal regulations which limits the power of license fees to be set at a local level. R.J. Reynolds (RJR) in a September 2000 document also names Cato Institute as an organization the company could rely upon to help the tobacco industry 'shift the debate and framework under which cigarette-related issues are evaluated in the future.' In the document, titled 'Reframing the Debate Communications Plan,' RJR states, "'Work with CATO Institute ... to empanel a group to debate legality and future management of cigarette industry. Open forum to media (pitch C- SPAN coverage); issue press release and transcript of remarks to media not in attendance.' A subsequent part of the plan says RJR could help sustain public interest in their points of view by encouraging Cato Institute to send pro-tobacco columns to the national media. Cato scholars have also raised a number of objections to cigarette taxes. Such taxes are frequently justified by the claim that smokers impose unfairly high costs on society, but in a January 10, 1998 commentary published in the Chicago Tribune titled "Smokers Actually Pay their Way," Peter Van Doren, Assistant Director of Environmental Studies at the Cato Institute, pointed out that smokers' premature deaths actually save taxpayers money, calling into question the fairness of imposing ever-higher tobacco taxes on them. Van Doren also pointed out that high tobacco taxes are highly regressive, noting that smokers tend to be disproportionately poor and minority. Robert A. Levy, an independently wealthy businessman who became a senior fellow at the Cato Institute in his 50s, has published numerous editorials criticizing higher tobacco taxes, lawsuits against the Tobacco Institute, and other anti-smoking policies. In one 1999 piece written with Cato fellow Rosalind B. Marimont and published in the Cato magazine Regulation, Levy acknowledged that smoking was a serious health problem but argued that the common estimates of 400,000 smoking-related deaths each year exaggerated the magnitude of the problem. In another 1999 piece published in the Wall Street Journal, Levy decried the Clinton administration's The U.S. Government's racketeering case against Big Tobacco|Department of Justice lawsuit against tobacco companies to recoup the federal government's cost for treating sick smokers. Cato has also criticized the 1998 Master Settlement Agreement (MSA) that 46 U.S. states signed with the tobacco industry. For example, Levy argued that the 1998 MSA, which he argues effectively created a government-run tobacco cartel for the benefit of large tobacco companies, created a situation in which tobacco companies no longer need worry about new competitors pushing down tobacco prices. He pointed out that the four largest tobacco companies have managed to maintain a 96 percent market share despite the costs of the settlement, and called the agreement a "sweetheart deal" between state attorneys general and the tobacco industry. Cato staffer Radley Balko testified before the Washington D.C. City Council in opposition to clean indoor air laws, arguing that smoking restrictions infringe on the liberty of business owners to decide what policies they wish to adopt for their restaurants, and the freedom of smokers. In his testimony, Balko claimed that "the health risks associated with secondhand smoke are debatable." Balko argued that employees worried about the impact of smoking on their health should work elsewhere: "A waiter or bartender who chooses to work for an establishment that allows smoking knows what kind of environment he'll be working in," he stated. As for non-smokers rights, Balko argued that "you don't have the right to walk onto someone else's property, demand to be served food or drink someone else has bought, and demand that they serve you on your terms. Free societies don't work that way," he stated. In his testimony, Balko did not disclose that the Cato Institute received funding from both R.J. Reynolds Tobacco Company and Altria, the parent company of Philip Morris. The Cato Institute runs a website dedicated to campaigning against big government. The website criticizes the government for excessive spending on agriculture and it urges greater privatization in the energy sector because ‘Federal research subsidies impose a burden on taxpayers, and they can be counter productive if they steer markets away from the most efficient energy solutions.’. They also argue that public transport should be privatized to avoid ‘costly one-size-fits-all regulations imposed on the states’ and state housing benefits should be cut because they ‘encourage dependency on the government, discourage self-improvement, and stifle renewal in city neighbourhoods’. The site also encourages less government involvement in education provision. In a video interview Chris Edwards of the Cato Institute argues that the government cannot afford to be involved in the nation’s education. In the Cato Institute’s ‘Handbook for Policy Makers’, section 45 outlines: Global Warming and Climate Change. This section of the handbook argues that global warming is less of a problem than suspected and outlines suggestions for congress, including not passing laws restricting the emission of carbon dioxide and how to report to the public about how such legislative measures would not be beneficial. The Cato Institute holds regular briefings on global warming, with known climate sceptics. In December 2003, panellists included Patrick Michaels, known-sceptic Robert Balling, Arizona State University and Michael Schlesinger, University of Illinois, who believes that the current scientific knowledge of climate change is not settled and that uncertainties “must be reduced”, amongst others.. Cato held similar briefings on Climate in Washington in July 2003 and 2002. Patrick Michaels is the Cato Institute's resident climatologist, he is a key player in criticising climate change science. He has received personal funding from the Intermountain Rural Electric Association, a leaked memo shows that they paid Michaels $100,000 in February 2006. Said Michaels in October 2003: “Contrary to almost every news report and every staged hearing… scientists know quite precisely how much the planet will warm in the foreseeable future, a modest three-quarters of a degree”. He has numerous links to anti-environmental and right-wing groups. He is an advisor to the American Council on Science and Health, The Advancement of Sound Science Coalition (now defunct), the American Policy Center and Consumer Alert. He has debunked climate change at a press conference for Consumer Alert along with other known climate sceptics. Along with Robert Balling (who often appears at Cato events) Michaels has represented the fossil-fuel corporate front groups the Global Climate Coalition and the Information Council on the Environment (ICE), the later funded by the National Coal Association. Leaked memos details how the Association planned test marketing of the idea to “reposition global warming as theory (not fact)”. .
Cato Institute scholar Doug Bandow resigned in 2005 following revelations that he took payments from the lobbyist Jack Abramoff in exchange for 'writing columns favorable to his clients'. Bandow had written a column for the Copley News Service and acknowledged to executives at the Cato Institute that he had taken money from Abramoff after he was confronted about the payments by a reporter from BusinessWeek Online. The Cato Institute is led by a board of directors, including some key players such as: Founder and President of Cato Institute Edward H.Crane; Robert A. Levy (Chairman of the board, Cato Institute); John C. Malone, Chairman Liberty Media Corporation; and David H. Koch (Executive Vice President of Koch Industries). Edward H. Crane - Founder and President - Board of U.S. Term Limits, and is a member of the Mont Pèlerin Society. Peter Ackerman - Managing Director, Rockport Financial Ltd.
Ethelmae C. Humphreys - Chairman, Tamko Roofing Products, Inc.
David H. Koch - Executive Vice President, Koch Industries, Inc.
Ronald A. Bailey - Science correspondent for Reason magazine. Patrick Basham - is founding director of the Democracy Institute and an adjunct scholar with the Cato Institute's Center for Representative Government. Robert L. Bradley Jr. - is president of the Institute for Energy Research. He is an expert on energy policy and its relation to the environment and an adjunct scholar at the Competitive Enterprise Institute. Terry L. Anderson - is executive director of the Political Economy Research Center (see below), and co-author of Free Market Environmentalism. Michael Gough - author of Silencing Science, Readings at Risk and Dioxin, Agent Orange, “is an expert on risk assessment and environmental policy” according to CATO. Or according to PR Watch “he has spent much of his career denying that environmental problems even exist ..and he frequently trashes health and environmental advocates”. Cassandra Chrones Moore - an adjunct scholar with the Competitive Enterprise Institute and the author of Haunted Housing: How Toxic Scare Stories Are Spooking the Public Out of House and Home. Thomas Gale Moore - is a senior fellow at the Hoover Institution. He is author of Climate of Fear: Why We Shouldn't Worry about Global Warming, and a contributor to the World Climate Report edited by Dr. Patrick Michaels (see below).. Moore was a member of Reagan's Council of Economic Advisors (1985-89). William A. Niskanen - Chairman of Cato since 1985. He was previously acting chairman of President Reagan's Council of Economic Advisers. He has also served as director of economics at Ford Motor Company and as a defense analyst for the Pentagon, the RAND Corporation, and the Institute for Defense Analyses. Richard L. Stroup - is professor of economics at Montana State University. “He is an expert on privatization, the environment, and Superfund. He is co-author of Economics: Public and Private Choice”. David Schoenbrod - professor of law at New York Law School. “He is an expert on the delegation of executive powers, federal regulation, injunctions, air pollution, and institutional reform”. Jerry Taylor challenges the “market failure” critique of free markets as they pertain to energy policy and environmental protection. “Under Taylor’s direction, the Cato Institute has become the nation's most influential critics of federal and state environmental policy”. Dwight R. Lee - professor of economics at the University of Georgia. He is an expert on environmental economics, the economic analysis of government, and labour economics. Peter VanDoren - Editor of the quarterly journal Regulation, and an expert in the regulation of housing, land, energy, the environment, transportation and labor. Benjamin Zycher - A senior economist at RAND. He is an expert on public finance, regulation, insurance, environmental and energy economics, and the economics of defense. Cato works on all the major policy issues, including a myriad of environmental ones, including Air Pollution Population, Urban Sprawl, and Sustainable Development, Forests and Forestry, 5th Amendment (property rights), Global Warming, Public Lands, Energy, Risk Assessment/Science and Public Policy, Environmental Law, and Regulation, Superfund, Natural Resources, and Water Policy. Some of its most important and high profile are global warming, “sound science,” attacking the environmental movement - see below - and climate. The Cato Institute have intermittently contributed to debates over water policy in recent times. Unsurprisngly this has taken a tone which chimes with Market Environmentalism. Given Terry Anderson, co-author of Free Market Environmentalism is one of the main contributors it’s even less surprising. Publications from the Cato Institute advocating private property rights of water include Water For Sale: How Business and the Market Can Resolve the World's Water Crisis by Fredrik Segerfeldt, Water Policy: Ending the Drought by Terry Anderson and their Policy Analysis Paper Going With the Flow: Expanding the Water Markets by Terry Anderson and Donald R. Leal. Steven Milloy is the “junkman” an industry hack who is an apologist for the tobacco and oil industries. He also routinely denigrates environmentalists as “eco-terrorists”  , or psychologically challenged” or “bogus”, “environmental extremists”, “blowhards”, “turkeys”, “nut cases”, or members of the “food police”, through his website junkscience.com. In the late nineties, Milloy was registered as a lobbyist for the EOP Group. In 1997, Congressional lobbying records show that Milloy and the EOP group client’s included American Petroleum Institute, FMC Corp, Fort Howard, International Food Additives Council, and Monsanto. In 1998, through the EOP Group, Milloy was a registered lobbyist for the American Petroleum Institute. TASSC was quietly retired in 1998 only to be replaced by other Milloy websites such as No More Scares.com which was set up with Bonner Cohen, the editor of EPA Watch, published by the American Policy Center (APC), which is headed “by long-time PR pro Thomas DeWeese”. In 2000, the nomorescares website was used to launch a report called “The Fear Profiteers” whose authors included Milloy, Bonner Cohen, John Carlisle, Michael Fumento, Michael Gough, Henry Miller, Kenneth Smith and Elizabeth Whelan. “All have a track record of accepting funding from and defending industries that make dangerous products and pollute the environment”. Nomorescare is now also defunct. Another website runs by Milloy was consumerdistorts.com, which is also defunct, so Milloy’s main weapon of propaganda is junkscience.com and a column for Fox news. In 2001, Milloy published the book Junk Science Judo: Self-Defense Against Health Scares and Scams, and used the attacks on the World Trade Center to argue the case for more asbestos. A year later Milloy set up yet another front web-site called StopLabelingLies.com that claims to be dedicated to exposing “examples of false and misleading food and other product labels and their associated marketing campaigns,” but its “real mission is to attack organic foods on behalf of the biotech industry”. The site tries to hide links to Milloy, but was originally registered to Citizens for the Integrity of Science, a paper organization that, according to PR Watch “ Milloy sometimes lists as the sponsor of his other web site, JunkScience.com.” Indeed it is as the Citizens for the Integrity of Science that Malloy has joined the CEI and other groups attacking climate change. Exxon documents show that it has given $30,000 to the Advancement of Sound Science Council rather than Coalition. This organisation does to seem to exist elsewhere, so even though TASSC is widely seen to be defunct, Exxon may still be funding it in a slightly different guise. ↑ Peter Van Doren, "Smokers Actually Pay Their Way", Unknown newspaper, January 10, 1998. Bates 2074058288. ↑ Paul Duggan, "Lawyer Who Wiped Out D.C. Ban Says It's About Liberties, Not Guns", Washington Post, March 18, 2007; Page A01. ↑ Robert A. Levy and Rosalind Marimont, "Lies, Damn Lies & 400,000 Smoking-Related Deaths", Regulation, Volume 21, Number 4, 1998. Bates 106039821/9827. ↑ R.A. Levy, Clinton's Illegal Assault on the Tobacco Industry", Wall Street Journal, February 8, 1999. Bates 106039481. ↑ Robert A. Levy, "Tobacco Cartel: Alive and Well", Cato Institute, May 11, 2001. ↑ Radley Balko, "Testimony of Radley Balko, Policy Analyst, Cato Institute, before the District of Columbia City Council", District of Columbia City Council, June 14, 2005. ↑ T. Stein (2003) “Unstable Climate Linked To Pollution Boulder Experts Cite Causes Of Warming”, The Denver Post, 5 December 2003. ↑ Source Greenpeace - data from company reports for 98, 00, 01, 02 – data not available for 99 and pre-98. This page was last modified on 14 October 2016, at 09:34.